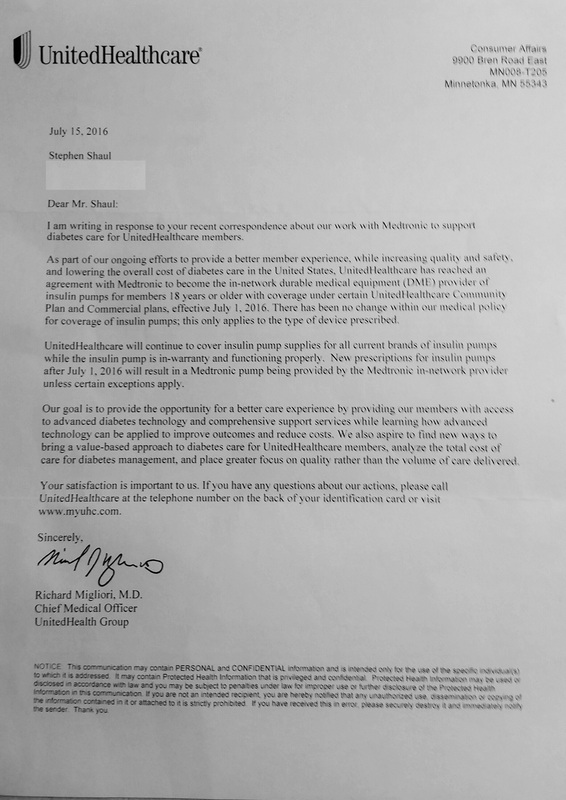 I’m not sure the letter has a purpose, other than to prove that the writer, Dr. Richard Migliori, Chief Medical Officer at UnitedHealth Group, can write an entire page full of words and still not say anything meaningful. I suspect that in this case, that was the point. Plus, in all fairness, it’s hard to be both a doctor and an administrator at the same time. Now, you might think this letter would make me mad, because it doesn’t really address my concerns at all. But I view it positively. Despite the archaic nature of the correspondence, it is actually communication. From a real person. Here’s the thing: As a result of the various #DiabetesAccessMatters campaigns, people know we exist now. And they feel like they need to respond to us. Look… UHC wasn’t going to get a bunch of letters and then immediately wake up and say, “Whoa, maybe we’re not doing the right thing here. Maybe we should change our minds”. But in raising our voices, we began a dialogue. It’s a dialogue that will probably have to continue for some time, but that’s my point. Now that the dialogue has been opened, we need to keep the conversation going. Maybe that means responding to a letter like this directly. Maybe that means calling your state’s insurance commissioner to voice your concern. Maybe that means letting your employer know that UHC isn’t your favorite insurer right now. That’s what I did, and I think my state insurance commissioner is next. Much of the answer to the #DiabetesAccessMatters issue is the same as it is for other issues before us as People With Diabetes or friends or family of PWDs. To win the day, we must apply pressure, and keep the pressure on. We need to overcome fear by standing in the knowledge that we are on the right side of history. We’re not asking for anything more than what we deserve. UHC patients are not asking for anything less than what they had prior to July 1. Because it’s what they deserve. It’s what they’re paying for. And, oh by the way, it wouldn’t cost UHC one extra dime to allow the same choice that existed less than a month ago. So don’t stop communicating. This conversation may be just beginning. It’s up to us to make sure it doesn’t end until choice is restored. « Sometimes, the Diabetes Community wins. Stephen, I’m not sure how you can read that and not be mad. It’s ruining the quiet zen I had just achieved with my first cup of coffee. Two mega-companies are deciding what is best for patients based on what is best for their stock prices. Not doctors, not educators, not even the patients matter in this decision. Medtronic must have cut one heck of a deal to UHC for the exclusive. It’s like a loss leader on razors–we’ll give you the handle, but the supplies are where we’ll make up for it. I’m not even on United and I don’t use Medtronic (and never will after this), but this kind of decision making, solely based on the bottom line and not on the best interests of patients, scares the crap out of me. I look forward to hearing your ideas on keeping up the pressure. I love your passion Melinda! Sorry I ruined your quiet zen. My next move is to voice my disapproval with my state’s insurance commissioner. In my state, they take citizen complaints seriously. I sense it is just an opening shot, ahh getting angry does not do much, right now they have no reason to change what they are doing. In 5 years, it is up to us to make sure they do.